I almost hate to write this post. It's déjà vu all over again. Such was my reaction to a recent headline in the Pueblo Chieftain: "Two More Cows Found Mutilated." Eastern Colorado was central to the "cattle mutilation" meme of the 1970s. I was younger and wishing that one day I would be a newspaper reporter so that I could really learn what was going on. I write "meme" for a reason, and the Chieftain article illustrates it perfectly. The news media tend to follow these "rules" of reporting topics that are pre-judged to be non-serious. 1. Assume that these events are paranormal, inexplicable, or silly. 2. Treat anyone--such as a self-proclaimed UFO expert--as a legitimate source. it was non-serious, "soft," involving UFOs and what-not. Consequently, the reporters involved were not necessarily the A-Team. At the Colorado Springs Gazette-Telegraph, the main reporter was a middle-aged feature writer, a friend of my dad's, who had mastered the art of being inconspicuous and inoffensive. She never rocked the boat and always wrote down what her sources told her. (She did have a more interesting life outside the newsroom, however.) Her stories were treated more as entertainment than as "hard news" -- and yes, the blatant phallicism of that term is entirely appropriate. What strikes me about this newest story is the totally uncritical acceptance of the old 1970s narrative. The mutilations are carried out with "surgical precision." Oh yeah? Did you ask any surgeons, veterinary or otherwise? Did you know that a cut in flesh, left to sit in the sun for a day or two, will swell and look smoother (more precise), even if made with canine teeth? There is "no blood." Have you studied what happens to blood in a corpse, how it pools at the lowest point and coagulates? And who is interviewed? Some UFO expert. Who is not interviewed? An expert on four-footed predators. A specialist in veterinary necropsy (your local vet is not a specialist). An expert on narrative frames applied to inexplicable events, such as "satanic panics, " witch hunts, and other folklore. The last is perhaps the most important. The woo-woo factor, you know. A couple of days after the Chieftain article, another piece appeared in the Denver Post: "Wild Dogs Terrorize Eastern Plains." Delivery drivers have been stranded in their vehicles, cattle stampeded and stockmen have lost sheep, goats, lambs, calves and even pet dogs, county officials say. Do you suppose there might be a connection? There could be other explanations, equally mundane. But once the woo-woo narrative frame is imposed, events are seen as strange and mysterious, revealing our fears about satanists, Vietnam veterans, or whatever the latest scary thing is. * Chas S. Clifton, “Mutilation Madness,” Fate, June 1988: 60-70. • How the properties of water limit tree growth. • Carnivorous plants do not grow hereabouts but they still have their admirers. • A Flickr-based wildflower field guide organized by color. • Every man should carry one of these -- and, of course, women might as well stash one someone on their person as well. I do like living in a part of the country that has its own regional dress. Sure, put on that bolo tie. But sometimes there is a gap between theory and practice. Our sheriff and the one deputy who lives nearby dropped by the volunteer fire department meeting last night to discuss enforcement of the outdoor fire ban. They were both picture-perfect Western lawmen: tall and lean and firm of jaw--in their sixties, but no potbellies. They wore dark-green uniform shirts and tan trousers, topped with crisp, immaculate cowboy hats. They finished their business and left after a round of hand-shaking. Then the rancher/fire department board president resumed the meeting—until the telephone rang. It was for him. He spoke briefly, then stood up. "Sorry," he said, "I have to go have a calf." And he put on the cap I always see him wearing in cold weather, the kind with ear flaps and an imitation-sheepskin lining. In his truck or on horseback, he typically dresses like a Midwestern dairy farmer. This man runs one of the two large working ranches in the area, but he never seems to go for the "stockman " look. And in that he is not unique, when you get down to it. Just practical. 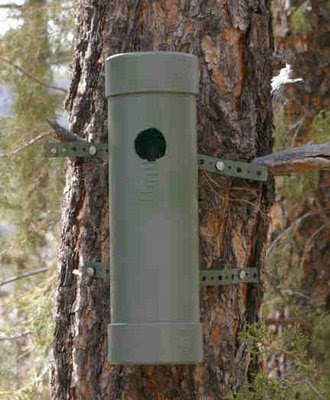 This is a new bird house (nest box, for purists) built more or less according to plans published by the Cornell Lab of Ornithology. Read about it there or go directly to the plans. Those plans called for 3-inch PVC pipe, and I had some 4-inch PVC lying around, so I used it. A different set of plans in fact calls for the 4-inch. Not everyone likes the idea of using PVC, but it is pretty much bombproof. We have several boxes scattered around the property. Generally the birds ignore them. One year some white-breasted nuthatches did raise a brood in one bird house, but then they did not return. Wrens have filled others with little twigs and then ignored them, which I gather is a typical wren thing to do. A 1997 Outside article on facing death by hypothermia by Peter Stark. But for all scientists and statisticians now know of freezing and its physiology, no one can yet predict exactly how quickly and in whom hypothermia will strike--and whether it will kill when it does. The cold remains a mystery, more prone to fell men than women, more lethal to the thin and well muscled than to those with avoirdupois, and least forgiving to the arrogant and the unaware. Cherry stuff. I had heard about the English moor-walkers when I was a kid, and I never forgot that story. ¶ Mice are creatures of Satan, and Mickey Mouse must die (YouTube). ¶ A small child left unattended with a dangerous breed of dog. ¶ Disposing of dead bodies--for science, of course! "It’s guns and skis, you know? It’s just a lot of fun," said Bill Weidner of Warrenville, Ill., who has taken up the sport of biathlon in middle age. He is quoted in a New York Times piece on a small biathlon renaissance. Apparently the fashion section is less like to hyperventilate about guns than the news pages--who knew? As Sebastian points out, however, writer Katie Zezima makes one small error: biathlon's origins lie in early Scandinavian ski troops more than in hunting. Those are re-enactors in the photo, portraying 19th-century Norwegian ski troops. For more history and images, including this one, go here. I have always liked the idea of the snowshoes-and-flintlocks "primitive biathlon" too. When I was little, I wondered at the fish symbols on Dad's workshop calendar that marked the supposedly best days for fishing. (He paid little attention to them, I suspect.) They were based on some version of the Solunar system, which is supposed to explain when fish and land animals feed most actively. Field & Stream magazine has long published them (readers revolted when they were removed), and there is a version on its website. Comes now Maddy, Grade 8, Park Forest Middle School, State College, Pa., with her research project "Does the Moon Phase have an Effect on the Birds' Activity? Maddy's research is published in Classroom Birdscope, a publication of the Cornell Lab of Ornithology. Students like Maddy created hypotheses involving wild birds and then tested them. (Cornell offers resources for teachers and for homeschoolers.) In Maddy's case, she examined data other students had collected about feeder visits over the past year and correlated them with Moon phases. She graphed the results, but labeled her graph "a jumbled mess" because no clear pattern emerged except possibly for a spike in some species' feeder visits on the sixth day of the Moon cycle--just before the first quarter. I conducted my own less-documented experiment during November and December 2008, printing out a Solunar table for this longitude and then comparing bird-feeder activity to it. Frankly, I could not see much correlation. Nothing like a fire call to rouse you from after-dinner torpor. The telephone rang shortly before eight. Again, the location was close by--only a mile away. When I got there, the brush truck's strobes were flashing, but everyone was just standing around. Apparently someone had dumped smoldering wood-stove ashes outdoors, and they caught some other stuff on fire, but the inhabitants and/or the neighbors put it out. The truck left the fire house though, so there will be a report to file. At least I was about 50-percent less frazzled in getting my gear together and getting out the door than last time. "When I met you," M. said reproachfully on my return, "you were a poet." Last October, when I got these photos at what I call Camera Trap Spring, the pool of water was about the size of a typical bathroom sink. I put the camera in the same spot on March 2nd. The pool was equivalent to my two cupped hands. When I retrieved the camera on March 6th, it was gone. 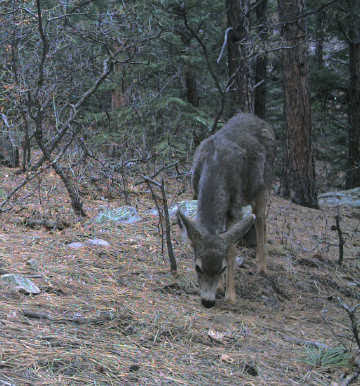 This mule deer doe and another came by later on the 2nd, and another photo caught her drinking. Now she will have to make a longer trip to the creek or maybe someone's stock pond. Some people look at the Colorado snow pack as proving that a drought apocalypse has been postponed. For those of us dependent on lower-elevation precipitation and for dryland farmers, things are not so good. These dry, windy days come one after another. I did awake this morning to snow -- about a millimeter of it -- and by late morning it was just a memory. Fires keep popping up -- all caused by human idiocy, as far as I can tell. It all feels like 2002, the year of no rain, the year the creek went dry, the year my stepmother spent in hospitals and nursing homes, with Dad getting more and depressed. They are both gone now, but this weather and waiting for water keep looping me back seven years. About ten this morning, M. and I left for Pueblo on a shopping trip. As we neared the bottom of our twisting driveway, I saw the department's brush truck, lights flashing, pass by on the county road. Not good. I reversed and drove back to the house. The light on the answering machine was flashing too: There was a fire on that road--somewhere. That road is two miles long. I laced up my fire boots, grabbed the pack with hard hat, etc., and was back in the Jeep. M. had already shifted the cooler (for chilled groceries) and other stuff out of it and into her car. And there was the fire! I just as easily could have walked to it. Somehow we had not smelled the smoke. Neighbor J. (that's his mailbox in the photo), who lives across the road, had made an initial attack with shovel and buckets. Then the truck arrived, and T.and R. knocked most of it down. 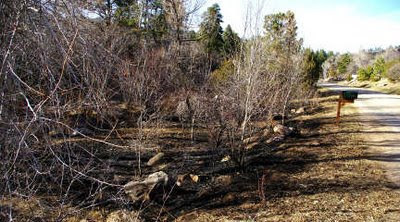 By the time I arrived, there was not much to do but help T. drag the hose around the clumps of willow and cottonwoods, while others stirred up hot spots with shovels. In less than an hour we had finished, and I could go to Pueblo after all. T., as asst. chief, had to talk to the landowner. The. Man. Had. Been. Burning. Trash. Outdoors. And he did it on a day with the temperature in the 60s F., relative humidity about 6 percent, and a stiff breeze blowing. He does come from a Central European nation where you never hear about forest fires, it's true. Embers had floated down a hill from his house, wafted over the creek, and landed in the riparian area where, fortunately, the flames were confined between the creek and the road and could burn only in two directions. "Next time we have a fund-raising drive, I'm going to knock on his door and remind him about today." As for me, I have started learning how the brush truck works, and about the floating gasoline-powered pump that we use for refilling its tank from a creek or stock pond. Thanks to a link trail that started at Retrieverman, I encountered the dogs known as "gollies." Since our Shelby is (we were told) a collie-Lab cross, I suppose that makes her a "lollie." Her actual antecedents and, for that matter, her age, are a mystery to us. Much about Shelby is a mystery. Actually, she is a Ninja Collie, bred for Stealth, Escape, and Deception. The weather is awful: up to 70° F. yesterday or more, and wind, wind, and more wind. A grass fire at Fort Carson (started in a training area, hmmmm) burned more than 6,000 acres yesterday and is still going. I went ahead and dressed today in jeans and a shirt that I could wear to a fire, if the call comes, since my official fire-resistant green pants and yellow shirt are on order. So I did not go out on that particular grass fire, but I now know that I could have gone, since it was on private land. I called T., the asst. fire chief, on Tuesday morning and learned that distinction. So I feel like a bit of a fake, like I dodged doing what I should have done, although T. was mellow about it. The down side of being in this tiny volunteer department is that training, etc., just sort of happens. The “red card” training is actually sponsored by the Florence VFD, although our people are welcome and the department will pay the $65 tuition. Having spent the last 19 years working in university bureaucracy, I have to adapt to this more apprenticeship mode. Yesterday (Tuesday) I filled my canteen and made sure what gear I have was all in order. The wind howled around the house all day. When the telephone did ring, I grabbed it breathlessly, only to have it be some CU-Boulder student “dialing for dollars” in a fund-raiser aimed at alumni. This Abert's squirrel is unusual in two respects. First, it is in the bird feeder, making it only the second Abert's to have gone there. I blogged earlier about the trail-blazer squirrel. There is a black one hanging around with this gray one (courtship?) --and maybe that is the same black squirrel that I previously photographed. Which brings me to the second oddity: All that I ever see in southern Colorado are black-phase Abert's squirrels, so this one's coloration is unusual for our area. Obviously the genes for the two-tone coat must be present in the black population. ¶ The Colorado Division of Wildlife advises that you think about mountain lions when landscaping. The only problem is that if you took all their recommendations, your grounds would look like a Wal-Mart parking lot. ¶ An undercover operative in a British animal-rights group tells his story. And you thought beagles were trustworthy. He was accepted by the ALF types after he video'd himself vandalizing a car, which tells you something about the group. ¶ At the Nature of a Man blog, a series on animal tracks in the snow.